Quite a lot of location recordings going on over the past month. Really some great experiences and challenges. Currently I'm working on recordings and mixes for some interesting groups like Sväva, CoolMoon, Simson, ZonderMeer and The Future's Dust. I will give an update soon, with more details on some of those projects. But look at this picture, isn't that the most idyllic recording environment ever? 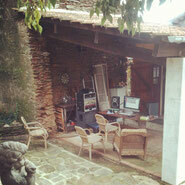 That was my setup a couple weeks ago in the South of France, recording ZonderMeer. So anyone out there with a great recording project and a beautiful location to boot, get in touch. I have time from February onwards. Here's what I've been up to these past few months. I rented a space in which I built a temporary recording studio. During my time there I recorded an album and EP by Orange Skyline, a new solo album with Arjen Hilberdink (ex-The Horse Company), an EP with Duroc, an EP with Simson and 2 songs for an EP with Flying Trashcans. Apparently EP's are the thing to do these days, although I disagree. The Orange Skyline EP is already out there. The rest is currently being mixed, mastered, pressed or otherwise processed. And in the meantime I've mixed yet more live recordings of the Roadburn festival, amongst others Elephant9, Goblin, Comus and Änglagård. Right now I'm working in an abandoned 19th century prison and next week I'll be recording in the mountains of Southern France. Hunting The Robot has just released their debut album on PIAS Records, called "Celebration Moderation". I mixed the album and added some vocals, mellotron, synths etc. On the 18th of April the band Ode To The Quiet will release their debut EP on which I also play some mellotron. And in other news, the "Lights In The North" short film has been selected for the Alchemy Film Festival in Hawick, Scotland. We're very exited for that and we'll be attending the festival as well. I have updated the website a bit with a new lay-out and added a new text about myself, making things a bit more personal. I'll update this place more frequently over the new year as new projects are coming to fruition. It's been a while since the last update. And there is lots of great stuff going on. But firstly, some might know already, I decided to quit playing in The Black Atlantic. I felt I wanted to pursue other things in life. I think Daniel and Johan are a great addition to the band and wish them best of luck. In the meantime I have recorded and mixed the new album "Calypso" by The Horse Company, to be released on November 12th. It's already gathering rave reviews. Furthermore I have been making an abstract video production for a performance of Maurice Duruflé's Requiem, made music for some silent films from the twenties by Germaine Dulac, did some mixing for the Roadburn festival recordings, and I have been working on new compositions by myself, of which you'll be informed in due time. And for those of you waiting for the "Lights In The North" film, we're almost there. It's been out there for a while now, but this week will feel as the definite official moment for me. After some delay, we will finally receive the vinyl of our new EP "Darkling, I Listen". Read more about the music or order your copy here. The 'Lights In The North' movie will premiere next week at the old Groninger Museum (Praediniussingel 59, Groningen). Starting on the 16th of January, around 16:00h. Here's the first teaser of the movie Eleanor and I are making right now. The Black Atlantic's new EP is finally finished, it took some time, but we are very happy with the end result. You can stream it here and the official release will be on Friday the 13th of January in Groningen during the Eurosonic festival. So, it was quite an adventure in the Northern Hemisphere. We kept a blog throughout the time. Read all about it here. The premiere of the film is expected on the 16th of January in Groningen, more news follows. I have been working on the soundtrack this last week. Expect some beauty and weirdness, arctic silence and lots of mellotron (church organ, wineglasses, piano, choirs, tuned bees as recorded at Mattias Olssons place). A teaser is coming soon. 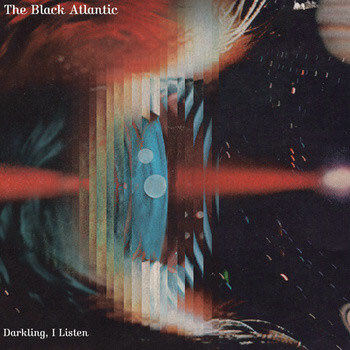 With The Black Atlantic EP it turned out that I mixed 3 of the songs after all. One song is done by Paul Pilot and we added a fifth and older song that was done by Chris Coady. We just got the master in from Sterling Sound and it sounds pretty amazing, really proud of this. Art work is looking great too. As always, I'll keep you posted on release and stream info. Yesterday evening I arrived in Stockholm. So the 'Lights In The North' project can get started. I'm very excited about this. We will try to keep you all posted on Eleanor's blog over here. On a different matter. The Black Atlantic has a break now. We'll do some shows in December again. Go to Live to checkout the dates. Last week I finished up the recordings. The project has become quite big for only 4 songs. Today the mixing will start at Keusgen Studio by Paul Pilot. I am really looking forward to what he will make of it. It's weird, because I have watched these babies grow over the last couple of months from such a close distance. And now to give them away to some one else feels weird. But I am glad to leave them in the capable hands of Paul and Klaus and I am off to make a movie about the Northern Lights which is so exciting. I guess you can't just have it all in life, can you...? The last preperations for my new project. Next week I will go to Sweden for 1,5 month to make an artfilm with Eleanor Kathleen Grootoonk. We will reside in a camper driving around the arctic circle, chasing the Northern Lights and we'll try to discover the myths and tales that surrounded this phenomenon throughout history. We'll launch a blog soon where you can keep track of our progress. As of now we have a new website in the air @ The Black Atlantic. We are recording a new EP. Drums and grand piano are tracked at the Keusgen Tonstudio in Haldern (GER), other instruments will be done in my home studio. The release date is set to 11-11-'11. You can make a pre-order now at aforementioned website. I wrote an article on the history of the mellotron for Dutch magazine Music Maker. It's in shops right now. We’ve set up a very sweet deal for you fans of The Black Atlantic. On Wednesday 8th September the band will perform at the awesome Popkomm Showcase Festival in the iconic Passionskirche. And we’ve decided to bring a long 50 of you guys to Berlin! Check some newly added live shows with The Black Atlantic here. There's more to come so keep an eye on this space or myspace.com/theblackatlantic for updates. Sep 08 2010 | 20:00 - DE - Berlin @ Passionskirche "Popkomm"
Sep 09 2010 | 14:00 - DE - Berlin @ La Vie en Rose "Popkomm"
Sep 23 2010 | 20:00 - LUX - Luxembourg @ Kulturfabrik | "Zikametz festival"
Dec 18 2010 | 20:00 - NL - Lelystad @ Underground "Stille Nacht festival"
Two of this years Roadburn shows I mixed are now online at VPRO/3voor12. Go here to listen to the reunited Comus who are playing their classic album "First Utterance" (one of my all time favourites) interspersed with some great, new tunes. And over here you can check out the fabulous US psych/prog band Astra, who used my mellotron m400 for the occasion. All the shows at the Roadburn Festival are recorded and eventually mixed and put online. Here's a complete list of what's already finished. I will join The Black Atlantic for their upcoming European tour, doing harmony vocals, some guitar, ukelele, piano and accordion. Visit The Black Atlantic for tourdates. I already did a try-out show in Germany and yesterday was amazing, as we did a support for Wovenhand in Paradiso, Amsterdam. Today is the opening of artfair 'De Kunstvlaai' at the Westergasfabriek in Amsterdam. Eleanor Kathleen is exhibiting her new stop-motion film "Grace in the Bubble", for which I made the soundtrack. Just got back from the studio, or put otherwise, it's remains. Because the Paperboat Studio in Zwolle is no longer with us as we knew it. I left the building to pursue new musical goals. It's all cleaned up now and in unbelievable good shape, considering the horrors it has seen the last couple of years. I moved most of the gear into my livingroom, the backline of Oceana Company went to our old rehearsal room and the rest went to a secondhand shop or the garbage disposal. Time for a new beginning... of which I will inform you in time. Online! Welcome to the brand sparkly new official website of Matthijs Herder, that's me! Not much here yet, come back soon.